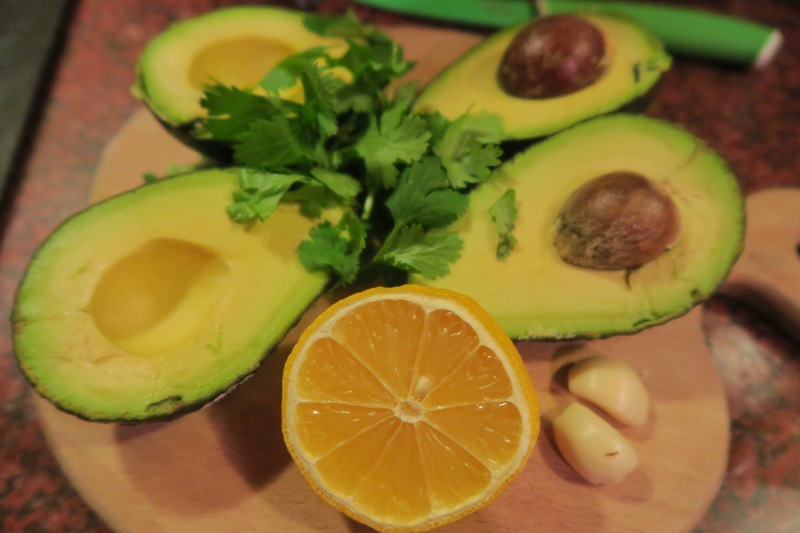 Avocado Sauce is a personal favorite, especially for the Spring and Summer. It can be paired with veggies or protein of your choice but this right here is my favorite combo. 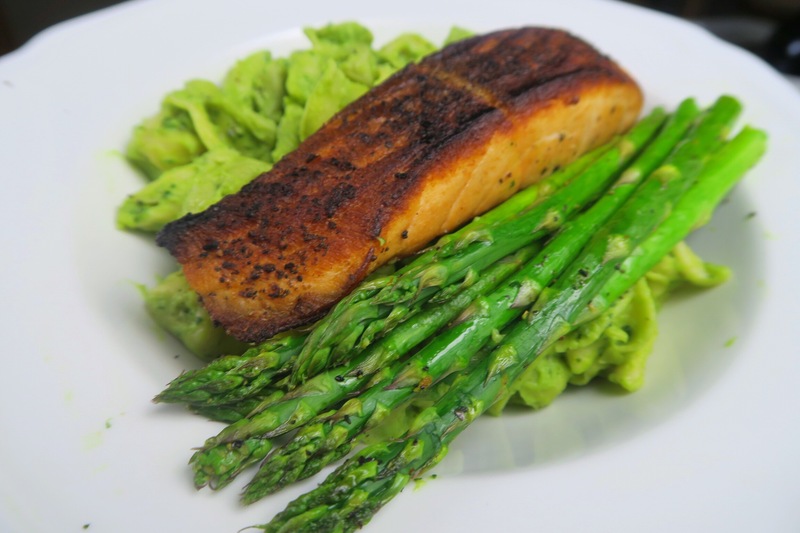 Salmon and avocado are a classic: on toast, cracker, pasta or even on it’s own! I love asparagus and love the pasta asparagus combo. The salmon on top is like the icing on the cake. I get salmon packs from Greensbury Market twice a month. Their fish and meats are fresh, organic and sustainable, and are delivered to my door (or anywhere in the U.S.), so I invite you to check out the Colorful Foodie Pack to see what I always order and you can get yours too! Make sure you use code COLORFULFOODIE when you’re checking out to get 10% off your order. 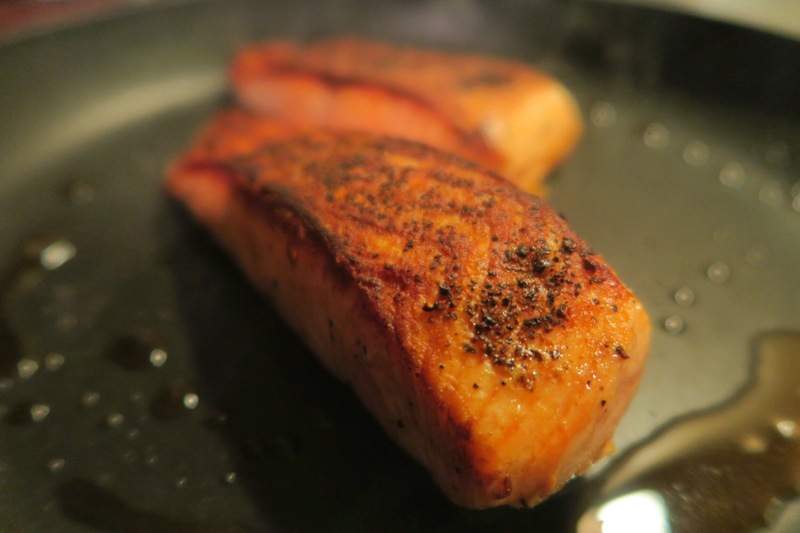 Pan sear salmon: Use butter or EVOO in a frying pan at medium heat. Sear salmon, about 2-3 minutes on each aide until a nice sear is achieved, like the picture above. 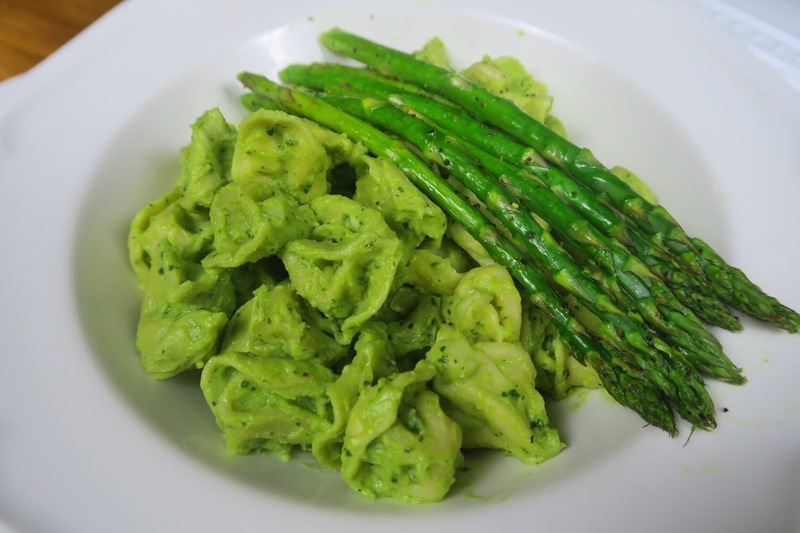 Add prepared avocado sauce to a sauce pan, season well with salt and pepper and toss in tortellini. Optional: to the food processor, add about 1/4 milk and blend. This will create a creamy sauce of the “dirty food processor” and you can add it to pasta. Arrange pasta on a plate and add roasted asparagus to the top. If you’re only into veggies, exclude salmon. This was absolutely delicious. It was the first time I paired avocado sauce with tortellini but won’t be the last. I hope you give it a shot, it’s the perfect dish for the Spring and Summer. Absolutely delicious! Don’t forget to check out the Colorful Foodie Pack! Snapchat: AnaSandee – I snap and cook so that means you can watch everything being made in real time! 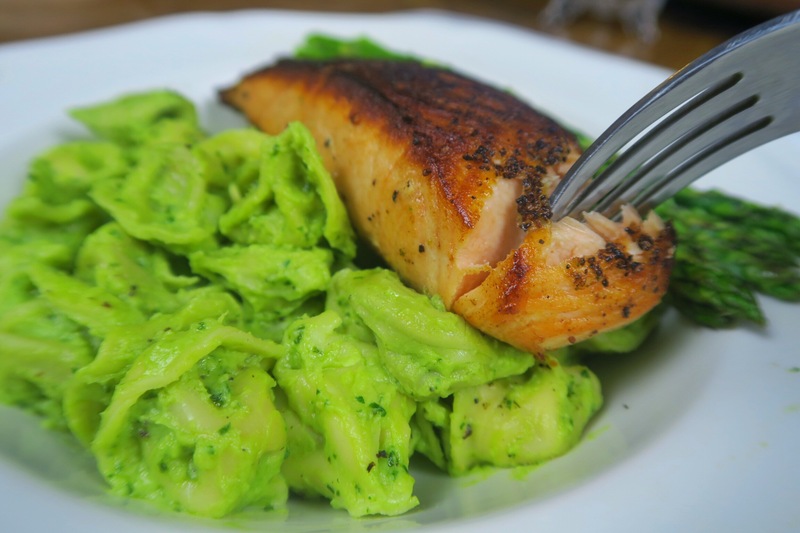 This entry was posted in Dine with me, Saucy Pastas, Uncategorized and tagged 4 ingredient sauce, avocado basil sauce, avocado cilantro sauce, avocado pasta, avocado sauce, avocado tortellini, pan seared salmon, salmon pasta.